The apex court verdict has not brought an end to the crises the state had been facing since more than two months now. 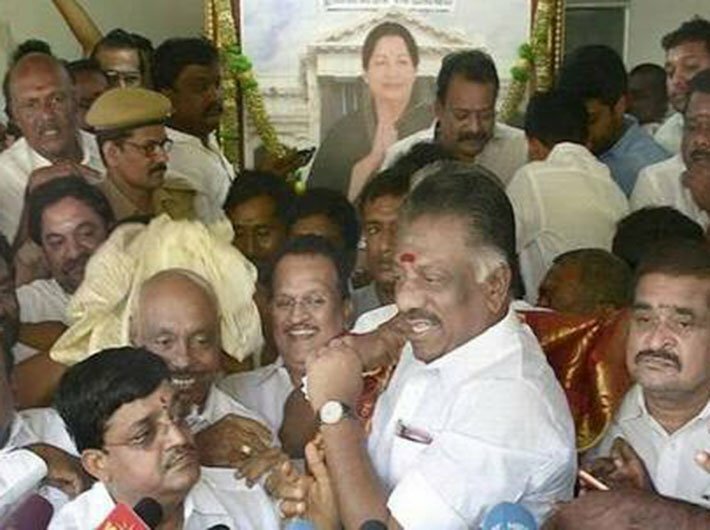 The tug-of-war between caretaker chief minister O Panneerselvam and Jayalalithaa’s aide Sasikala Natarajan, who was found guilty on Tuesday in a disproportionate assets case by the supreme court, may lead to a vertical split in the AIADMK. The apex court’s verdict has decided Sasikala’s political fate. She will now have to surrender and serve a four-year jail term. Sasikala is also barred from contesting an election for the next 10 years. “Truth has won. Sasikala was trying to become chief minister and her intention is defeated,” says Arul, a supporter who assembled at the Greenways residence of O Panneerselvam, who is popularly called OPS. But, the verdict has not brought an end to the crises that the state had been facing since more than two months now. The verdict has added to the uncertainty and political instability. The government may continue under OPS as caretaker chief minister for a longer time than people expected. The most distinct possibility now is that the party is going to be almost vertically split. Panneerselvam has already got the support of 10 MLAs. The attrition from Sasikala camp is going to continue following the apex court verdict. The state may go for election in the later part of the year. While talking to the legislators, one gets the impression that neither side is going to compromise. “After the verdict, we thought Sasikala would compromise but she doesn’t seem to be in that frame of mind,” says an MLA on the condition of anonymity. This may lead to split in the party. The principal opposition DMK too is likely to press for early elections. For the past three days, the DMK is giving signals that they may not support OPS. If DMK would have extended support to OPS, the government would have survived. Highways minister Edappadi K Palaniswami has been elected as legislature party leader. He will stake claim to form the next government. Many feel that Palaniswami lacks leadership acumen. Social activist Tamilaruvi Manian of Gandhiya Makkal Iyakkam says the party should go for OPS and not Palaniswami as the latter would work on the directives of Sasikala only. Tuesday saw quick political developments, with OPS being removed from primary membership of the party. Observers compare the current situation with what occurred after MGRs death in 1987. That time there was Janaki faction and Jayalalithaa faction. Janaki faction had the numbers whereas Jayalalithaa had popularity. Similarly, in this situation, Sasikala has got the numbers but OPS has the popularity. In the long run, OPS might be the winner. However, as of now he may not be benefit as the DMK may not vote in his favour. He may well lose his crown.